Posted April 27, 2018 by HPGhotrodLogin & filed under Uncategorized. The Forward Look cars from Chrysler Corporation are still considered among the best designed cars from the 50’s. They certainly raised the bar as far as automotive design was concerned for that time period. We look back and think that some of the ideas are quaint or maybe a little misguided but they still turn heads at car shows for their interesting body shapes and sweeping roof lines. During this period the toy companies took notice and wanted to cash in on the popularity of the cars as well. Being a toy collector myself, I have purchased a few over the years and decided to share a few Forward-Look pieces from my personal collection. 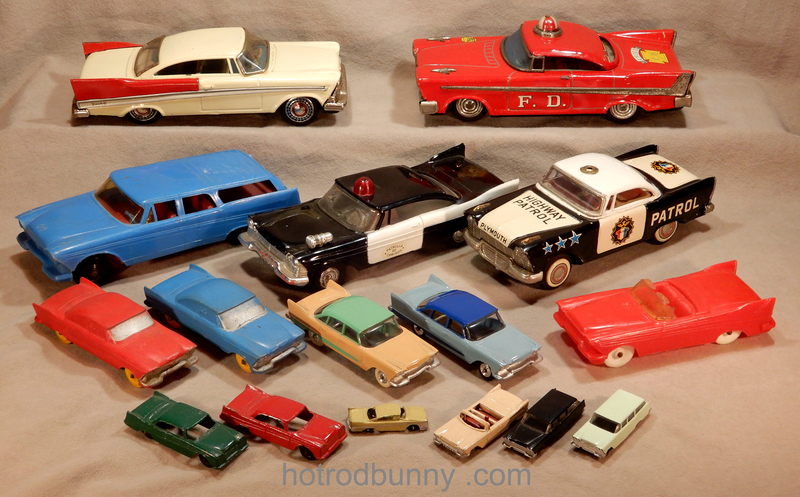 I have limited it to just the Plymouth Line and only toys that were produced when the car was new. That is; made in ’57 , ’58 or thereabouts. Some of these examples may have been issued a little after ’58 but the original tooling was started when the cars were new. This is by no means everything that was made. Just a sampling that I have been fortunate enough to find. The Tin Toy ’57 Plymouth “Fury” made by Bandai is obviously not a Fury since it lacks the correct trim. It is about 1/24 scale, detailed fairly well and came as both a hardtop and a convertible. The Tootsie Toy ’57 Plymouth was difficult to peg as a ’57 since the headlights look like they are dual instead of singles with a turn signal. The give away here is the side trim. These pieces are easy to find and were issued from ’59 to ’69. Two examples of the Dinky Toys ’58 Savoy four-door sedan. It came with both white tires and black. Auburn Rubber Company offered a nice, well detailed ’57 Belvedere two door hardtop. These are about 1/43 scale, maybe a tad bigger. They have a tendency to warp if not stored properly. Tin Toy ’58 Fire Chief car. This is probably the last version of this car before the tooling was retired. That’s the way it usually happens. The first issue is of a stock vehicle. Then to get a little more play out of the tooling or dies they offer police, ambulance and fire chief versions of the cars. I’m not sure who made it. But I have seen it as a black and white Highway patrol car as well. 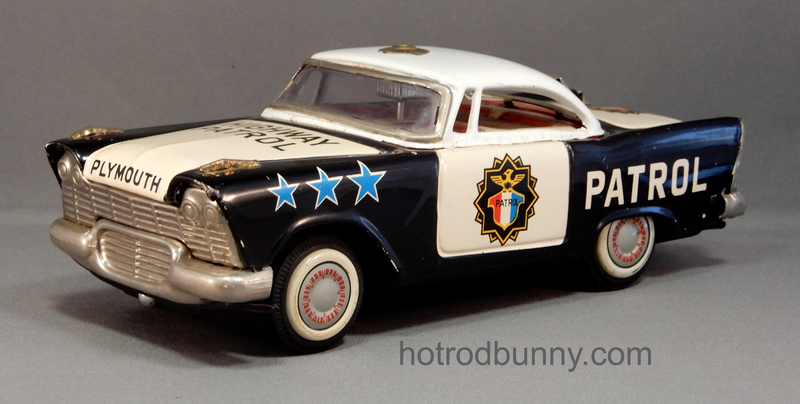 ’58 Highway Patrol. This car is a bit smaller but has better detail than the Fire Chief car. The roof light is missing on my example but is otherwise very clean. I believe this was made by Ichiko Kogyo in Japan. Here is a very rare plastic ’58 convertible. This was part of an auto transport set. I have a ’58 Cadillac from the same set. Both are convertibles without a rear seat. They all share the same glass; the GM wrap-around. 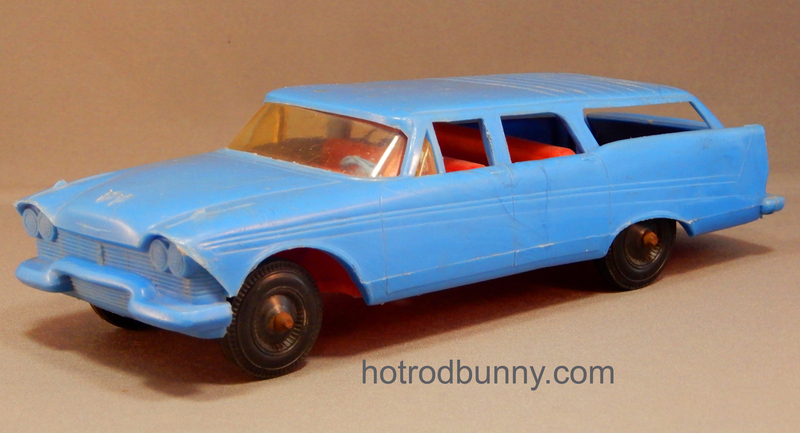 Another popular ’58 piece is this 1/25 scale station wagon. It features an opening tail-gate and originally came with a driver figure. I believe this was made by Processed Plastic. Most of the first issues were either red or blue. It was issued later in brighter colors including silver and had different wheels. The beige-pink ’57 Belvedere convertible is one of my favorite pieces in my collection. I found it at a toy show before it was considered to be very valuable. It is made by Budgie Toys in England. A Matchbox competitor and assembled its toys in a very similar manner to the Lesney products. It is close in size to the standard 1/64 scale die casts that we see today. I think that is the original price written on the side in grease pencil, 19 cents. How did Budgie make a profit? They still had to ship it over here. And that’s the retail price after the store marked it up. The station wagon might be Marx or Revell. These cars were from an auto transport train car from a ’58 train set. There were two different cars made for the sets. This ’58 Plymouth wagon and a ’58 Cadillac Fleetwood. Both are very square examples of their subjects and share the Cadillac’s wheels. Most that I’ve seen so far have been painted realistic fifties colors. The little car is very a small scale and was part of a set of new American cars. 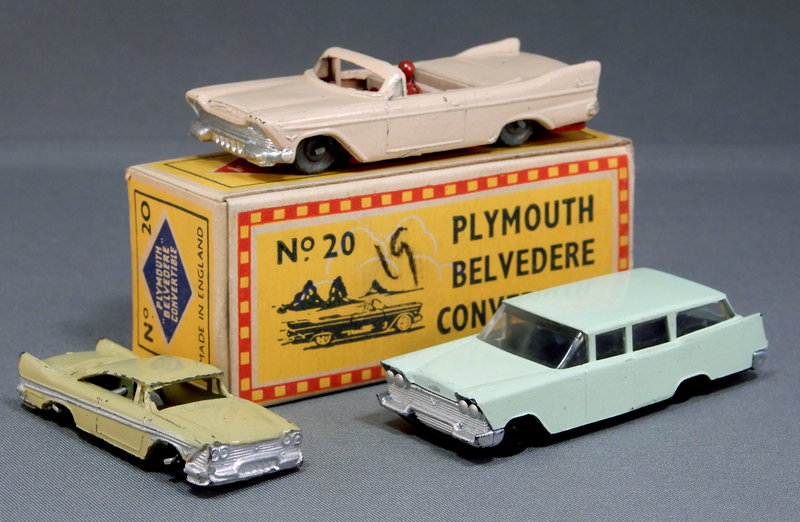 The AHI brand from Japan made miniatures of the American and foreign car lines every year. Complete sets can get a little pricey. In ’58 Jo-Han offered the Fury as a promotional model too. It was molded in the correct color with gold painted trim. Even the badge on the fin was changed have the Fury script. Both models had working torsion-bar suspension. Warp was a common problem with the early plastics. It has a great finish but warped with time. This condition on these cars is called the “JoHan smile” by some collectors. Here is a strange toy I bough on Ebay. It was made in Mexico and is clearly a copy of the Jo-Han promo but the wheel hubs and chassis were copies of the type used on Product Miniatures promotional models. The body has shrunk a bit over time and forced the grille to protrude at a funny angle. The decals are in Spanish. It is 1/25 scale. Hope you enjoyed this trip down The Forward Look lane. There are many different toys made of Forward Look cars. Chrysler Corp. was well represented in tin toys. They are expensive but really fun to look at.